Shailendra Yadav from Azamgarh, B.E. - B.Tech Graduate. are one of expert skill area's of Shailendra Yadav . 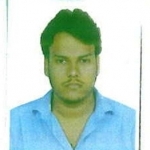 Shailendra Yadav is working in Service Engineers industry. WORK AS A TEAM OR ..